Like life, running is all about going from one place to another. It’s about the journey and embracing how the journey changes us. 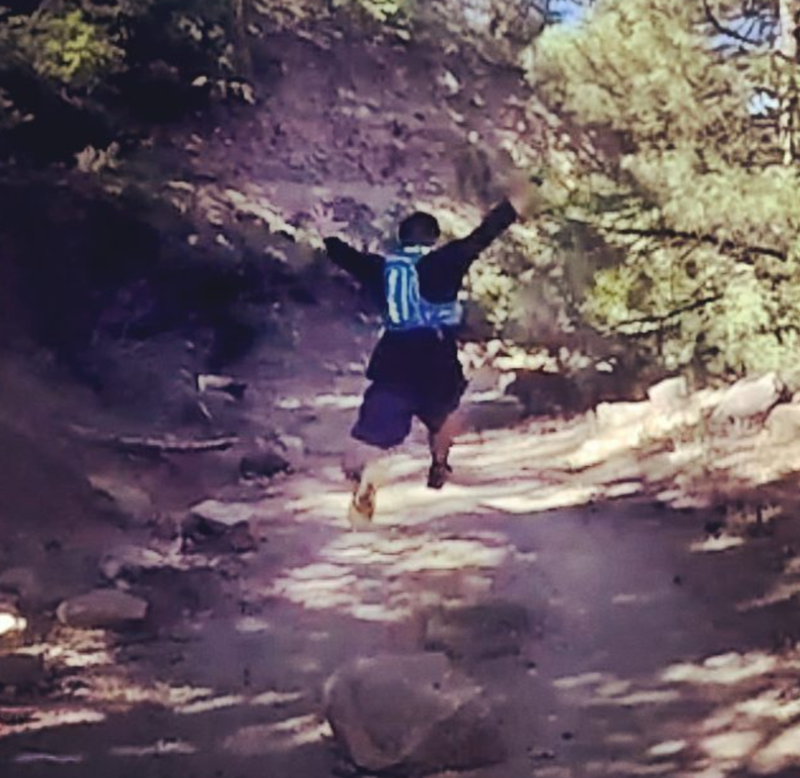 For me, the joy of running flows from the pleasure of having the chance to explore what happens to me when I run. When I run I love the experience of voyaging to and discovering new places both internally and externally. I love to explore how the internal terrain of my mind and emotions grows and changes along with, or in response to, the external changing landscape around me as I run down busy chaotic city streets or up tall mountains and through valleys as I get lost in the stillness and wonder of the wilderness. Wherever I run, whenever I run, I love the feeling of how running leads me to understand and reveal new things about myself and the world around me. Simply, put I run to understand. I love to be surprised at what bubbles up as my heart rate rises and I get immersed in the flow state. That flow state: where everything fades away and I am fully submerged in the moment of what is around me. The wind whipping by my face. The cement streets, dusty trails passing quickly beneath my feet and the tall grass brushing my legs. The sun warming my face. The sweat starting to build on my skin and roll down my back and soak my shirt. All of it gloriously leading me to the flow state. But the truth is that running almost never starts good. I have to work at getting to that flow state. And some run I only get a bit of flow or none at all, which is a whole other topic to explore on another post. So honestly, I usually feel crusty and rusty and out of sync at first. Of course I might not think this during the run but I love that fight. I’ve learned to embrace the struggle to get to that flow state. It’s part of the experience. Without that first 1-2 miles of initial struggle the joy of flow is meaningless. I love to gradually dig and dig and dig…and prospect beyond the surface and find the running gold that I’m so desperately in search of. The internal revelation is the gold I’m searching for. That flow gold is what I seek. Sure, the physical feeling is good and being physically healthy is a bonus. But ultimately it’s the psychological and emotional transformation that I treasure the most. So each run it’s like I am on the hunt to find something that will change me or help me appreciate life on a deeper level. And that’s what my “running gold” is. For me the running gold is finding a new truth or insight about why I run or who I am? So what “running gold” have I found recently? What has “the flow” revealed to me? Well, on my runs lately I’ve been thinking about the connection between the physical paths we take when we run and the emotional and psychological journey we go on as we make our way down roads, up hills, along treadmills and through beautiful wooded trails. Two Questions: What Am I Running To? What Am I Running From? Basically, I’ve been reflecting on Two Questions: “What am I running to? What am I running from? From those Two Questions I’ve been reflecting on and exploring what happens to my mind, heart and soul as I run the same routes on the roads, in the mountains and wherever else my run takes me. How does repetition and familiarity lead me to a deeper sense of purpose, meaning and awareness? As I explore those Two Questions, I’m fascinated, consumed and challenged with what happens to me psychologically and emotionally as I experience those routes over and over again? What happens when I go out and come back to the same place where I began? Does Where I Run Matter? What about my favorite routes? When I run my favorite routes am I remaining the same person? Am I changing even though the route remains the same? Do I like to run the same routes because I find comfort in familiarity and I don’t want to change or grow emotionally? Do the same routes keep me from growing as a person? Or does the discipline of repetition of the routes force me to do deeper and face certain things about myself that I might be running from? Can I make the routine routes more meaningful by changing my mental perspective? How do those familiar, personal and repetitive running experiences change me? Do they change me? Why do they change me? Because of those Two Questions, and whether it’s a new or familiar route, I’ve started to wonder about the connection between the fact that when I run I change my physical state. But how does this change in physical state, the rise in blood pressure, heart rate and being in the Flow State, impact my emotional state? Does my emotional state change along with my physical state. If so, how? When I come back to where I started on a run I wonder and ask myself… what did I just run from, what did I just run to? How are those looping and “out and back” routes pushing me to grow and challenging my perspective on life? 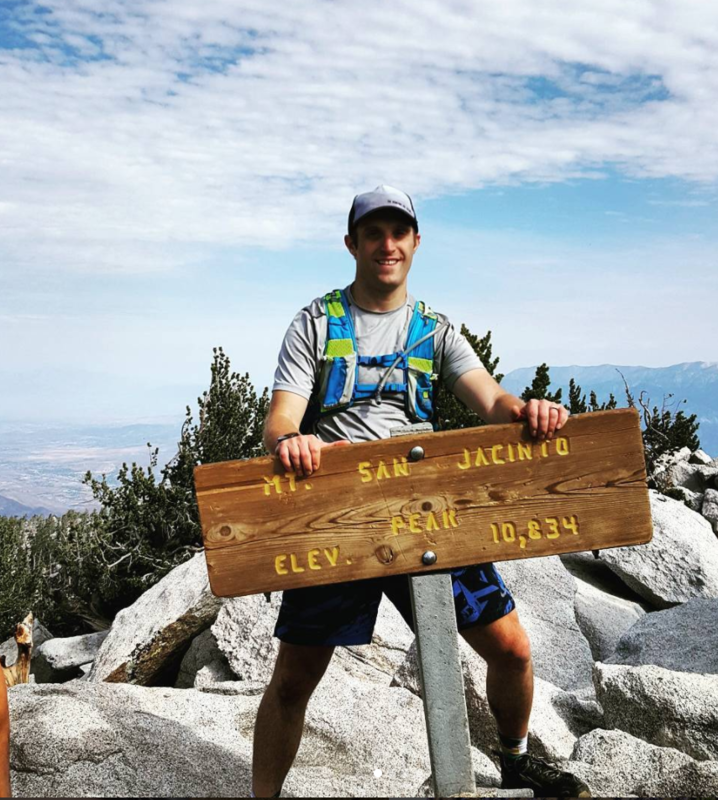 When I recently ran up to San Jacinto Peak, I couldn’t help but wonder… Was I the same person when I returned after that mountaintop experience? If I did change (and I know I did), did I remember what I just learned and experienced? Will I be able to take that moment of joy and revelation and flow state and have it impact the rest of my life? This bring me to a fear that I have when I run. It’s a fear that I’ve better understood as I’ve asked myself those Two Questions. What’s my fear? Forgetting what I learned when I run. I often forget about what I learn when I run but I don’t want this to happen anymore. I don’t do it intentionally but it just happens because that’s what the body does when you come out of flow state. But I don’t want to do that anymore. Whether it’s major or minor, I want to remember what I saw, felt and thought during my runs. I want to fully realize, appreciate and celebrate that I have been changed in my run. Sometimes it’s a big change other times it’s small. But either way I don’t want to let the flow gold slipped through my fingers. I want to remember and take action on what was revealed to me during my run. And it’s this fear that is actually powering the inspiration to write this post about the Two Questions. I don’t want to forget the gift that God has given me during my runs. I want to cherish and hold tight to that flow gold and pass on what I’ve learned to you. I want to be a conduit of inspiration. I want to inspire you, my fellow runner, to do the same. To have the same clarity and breakthrough when you run. I want us to have the shared pleasure and joy of learning from our runs. I want us to not only be changed physically but emotionally and spiritually. And understand the why and how on a deep and meaningful level. I want to take a moment and reflect on what happens to us during our runs. I want to appreciate the truth and magic of what just happened in our body and soul. And I want build on and take action on what I learn. Whatever that might look like. As I’ve shared in this post, whether I realize it or not, when I run I transport myself to a new psychological, mental and emotional destination. Thinking about what I’m running to and running from excites me. I don’t always like to ask those Two Questions and I often have to fight to get to that point of focus and flow. But I enjoy and welcome the struggle because I’m always in a better place when I do. So I fight to ask those Two Questions. I fight to explore the answers. I fight myself to face the new questions that bubble up. Why? I fight to ask those Two Questions because it helps me better understand and appreciate why I am here on planet earth. It helps me to remember that I’m not only running just to run but there’s a deeper purpose that we’re suppose to discover. And this, my friend, is why I believe I run. To understand thyself. For in these moments of flow, insight and reflection I drink in and let the greatest benefits, pleasure and true purpose of why I run rush through me. Those Two Questions give me the opportunity to discover more of who I am and what I am suppose to do in life. They give the running more significance to the world around me. Those Two Questions are not only a way to understand what’s going on inside me but those Two Questions give me a chance to get outside myself and connect more with the people and world around me. By simply asking what I’m running to and what I’m running from, I’m empowered and inspired to connect more with my fellow runners as think about them, their lives and how I can help and inspire them as we share this amazing and transformative experience together. So whether we’re running fast or slow. Whether we’re going up or down. Whether we’re going in a loop or “out and back.” Whether we’re returning to where we started or ending up in a new destination, let’s ask ourselves those Two Questions. What am I running to? What am I running from? And let’s explore the answers to those questions with ourselves and share the answers with each other. See you on the trails! Reflecting on CMX Summit 2017: Power of Story + Peak Moments = Community Strategy?